Are you fed up with SharePoint being excessively complicated and hard to use? Glasscubes costs less, is simple to set-up and quick to deploy. It’s easy to use, requires no training and our customer helpline provides immediate telephone support, which we know you’ll love! SharePoint’s complexity is a prime reason why user adoption for the platform is and will continue to be low. Sure, it has a wealth of potential as a solution for countless business problems across every industry; however, this is also the root of the problem: As Microsoft has continued to develop and add functionality to SharePoint, the platform has become more and more difficult for IT personnel to manage and for the everyday business user to navigate. It’s no surprise that companies in the finance industry have different business problems than, say, non-profit organizations. You will want to use only features that address your specific challenge areas, which means that all the extra functionality of the system will just get in the way, making your user experience more complicated than needed. A solution for this issue might be to configure or customize the platform to suit the needs of your users. But is that really a solution? Configuring takes extra time, effort, and money, and it requires personnel with developer and infrastructure knowledge. Meanwhile, your users are burdened by the extra steps needed to accomplish their tasks. Glasscubes doesn’t try to be all things to all businesses. It was developed specifically for business units, large groups, and corporate teams that don’t have the time, budget, or inclination to deal with unnecessary functionality that comes with a complicated enterprise collaboration solution. Other SharePoint alternatives offer complex features meant for larger, company-wide rollouts. 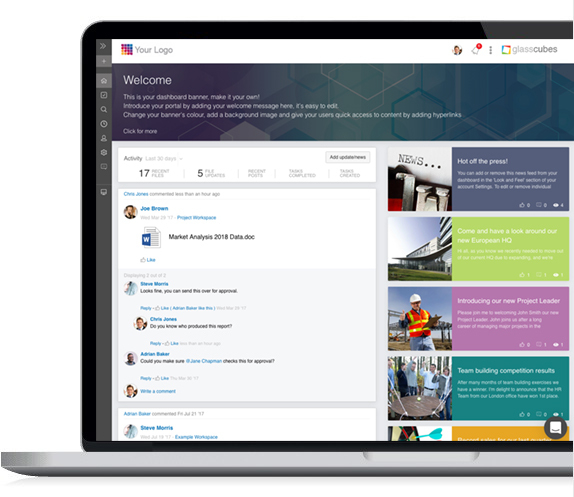 But our platform considers the main needs of business units​ or large groups and delivers only features that address those needs, including file sharing, communication, project management, and intranet/extranet—all features your teams want and can use to improve their daily workflows and engage effectively with one another. Glasscubes recognizes that corporate teams like yours don’t have overly complex needs, so you shouldn’t have to choose an overly complex solution. administer and manage the platform, including addressing change requests from users. Naturally, these requirements present an expensive challenge for large organizations, who either have to hire new personnel or split their current IT resources. And for corporate teams, such requirements are simply overwhelming, forcing them to look for alternatives to SharePoint. Unlike SharePoint, Glasscubes is a true out-of-the-box solution. Except there’s no box! ​An everyday business user can set up the Glasscubes platform and onboard other users in a day​.​ Just invite users to join your online workspace, and they’ll gain access to the complete service in mere seconds. 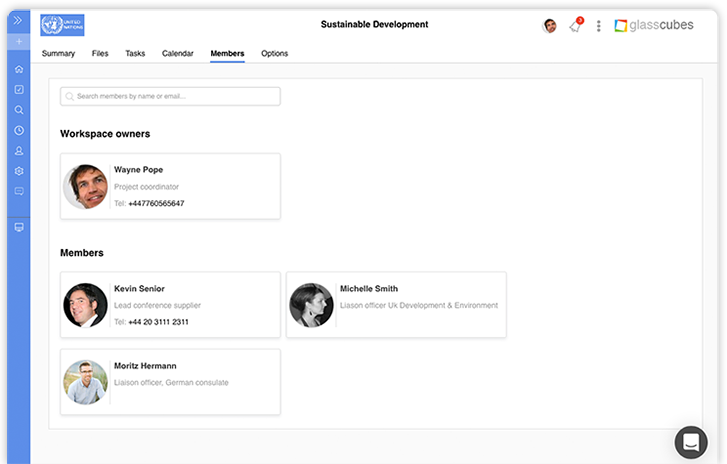 Plus, features like file sharing and task management are presented within an easy-to-understand user interface, so there’s no lengthy training required. 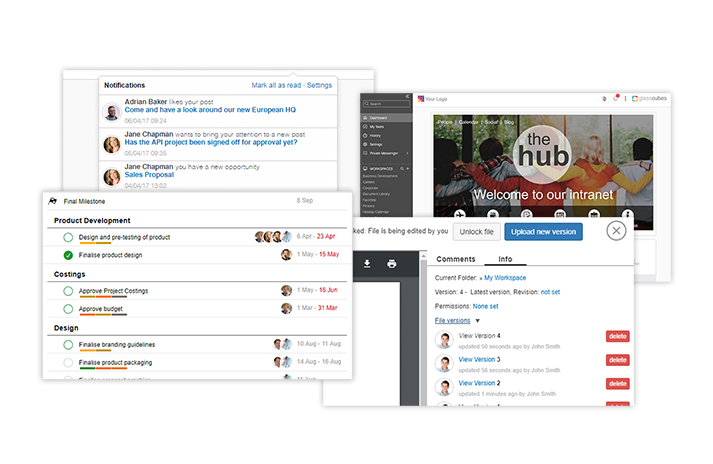 Your teams can spend more time collaborating and less time learning how to use the tool. This ease of setup is one reason why Glasscubes commands a higher user adoption rate than the likes of other enterprise collaboration solutions like SharePoint. Customers come to Glasscubes looking for something that is easy to get started with—and they find it! The inherent problem with SharePoint is the dependence on specialized personnel, IT or otherwise. This presents a clear path to bottlenecks. For example, you must wait on your IT department to implement or configure the platform. Plus, with hundreds to thousands of users, change requests are frequent. IT already deals with a host of other organizational issues, so requests regarding SharePoint can be easily pushed to the bottom of the priority list, leading to otherwise avoidable delays in user processes. 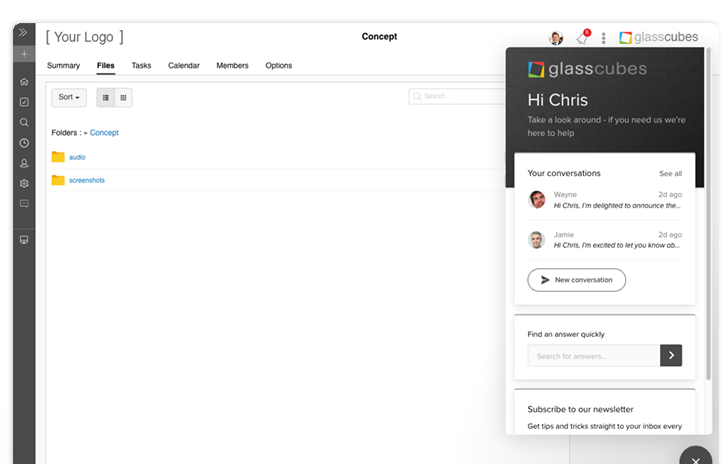 Glasscubes you'll never have to say, "We have to wait on IT"
With Glasscubes, there’s no specialized knowledge required, so any member of your team can make most changes. This eliminates delays stemming from the time-poor IT department and ensures your teams can make full use of the platform around the clock. If you’ve used SharePoint before, you know how often you’re faced with unforeseen costs just to ensure the platform remains in a useable state. These costs typically come in the form of additional license options, third-party applications, or paid support. Because Glasscubes offers a defined set of features developed for large groups and corporate teams, we can be straightforward and clear about pricing. What you see is what you pay—with options across three pricing tiers that include a standard monthly account fee and tier-specific user fees. You know what you’re getting into with Glasscubes. No need for extensive spreadsheets or psychics to figure out or predict the cost. We recently switched from a web-based SharePoint system to Glasscubes. The demo was very useful and the set up was very straightforward. We have now completed the migration across and having been using it for a couple of weeks, we are all very impressed. Our support is often highlighted by customers as among the very best that they have experienced. This is because every Glasscubes customer receives the highest level of personal, professional support, with a response time that is unmatched elsewhere in the industry. In addition to our telephone support we also offer real-time chat support built directly into the platform. Collaborating externally using SharePoint is not straightforward, which is essential if you want to securely share information and collaborate across corporate firewalls. SharePoint on-premise requires specific ‘external licenses’ and SharePoint online needs all external collaborators to subscribe to Office 365. In comparison, any external users can be invited to join Glasscubes in seconds. The beauty of Glasscubes being in the cloud is that you can access your account from any mobile device with an internet browser. Our native mobile applications are the best way to use Glasscubes when you’re on the go. With instant syncing across devices and custom push notifications, you won’t miss a thing! Glasscubes offers a similar level of functionality to SharePoint but in a user-friendly environment that achieves higher levels of adoption. 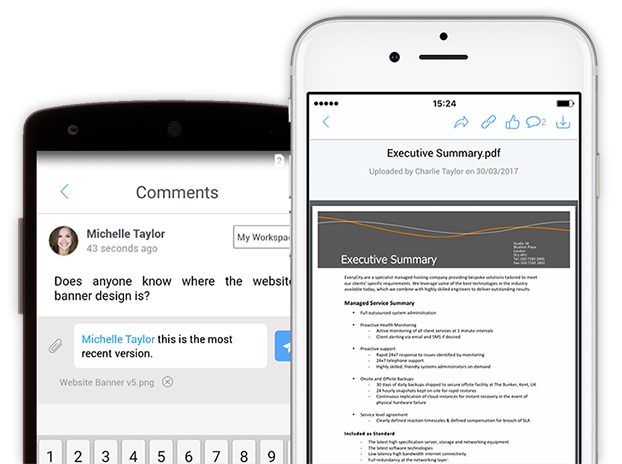 These include secure file sharing, content control, document management, scheduling, project management, threaded discussions, real-time collaboration, client/partner portals and a comprehensive suite of intranet functionality.